Laure Genillard are pleased to present new works by Michel Verjux in his first solo exhibition in the UK. 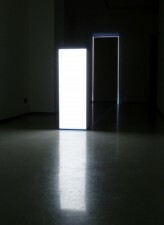 Born in 1956 and based in Paris, Verjux has used light as his primary medium from 1983. 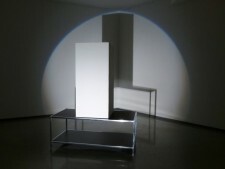 His works are constructed by projecting circular beams on walls, or into the environment with a powerful projector. Circular or semi-circular, truncated or involving a shadow, the light projections relate to a moment in time in a given space. The ‘éclairages’ reflect on the act of showing through multiple profiles, cuts and points of focus. Recent museum exhibitions include; forthcoming, ‘Lumineux, Dynamique, Espace et vision dans l’art de nos jours à 1913’ Galeries Nationales du Grand Palais, Paris spring 2013. Breathe, Walk, Look, Dallas Contemporary Art Center, 2011 .Le mur, l’espace, l’architecte, Museum Fernand Léger, Biot, 2010. Sous le plafond (sur le sol, exactement),Villa Arson, Centre national d’art contemporain, Nice, 2010. FUTURfestARTEdiLUCE. Luci dal Futuro. La Notte del centenario, Galleria d’Arte Moderna, Villa Reale, Milan, 2009.